Dental care is a very important part of health care in pets, yet it is frequently underestimated and overlooked by owners. 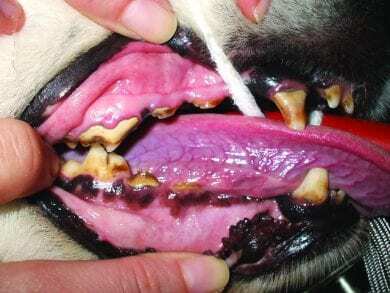 Dental disease is very common in dogs, cats and rabbits. It can cause halitosis (bad breath), difficulty eating, gum infections which can lead to the formation of abscesses, septicaemia (infection of the blood), severe pain and even swellings around the eye socket. Imagine how your teeth would look if you didn’t clean them every day. If left uncleaned and unchecked, bacteria and plaque deposits build up on the teeth. Our pets are very good at hiding pain and may therefore continue to eat and drink despite being in severe pain through dental disease. It is estimated that 85% of pets over three years old need dental treatment. A good example of clean teeth, yet the gums bleed easily when the teeth are brushed – indicating gingivitis which will ultimately lead to gum recession and tooth loss. The problem all starts with plaque – a layer of bacteria, food and saliva that naturally forms on the surface of the teeth but invades into the area between the tooth and gum – the subgingival space. The bacteria in the plaque and the toxins they release irritate the gums causing inflammation or Gingivitis. The minerals in the saliva combine to form Tartar which further irritates the gum and allows more bacteria to develop. Here we can see plaque on the teeth which is starting to encroach on the gum line. This photograph shows the teeth once the tartar has been removed – it shows that the tartar was hiding marked gum erosion and red (sore) gums and that not mush is holding this tooth in place. The tooth will be infected, wobbly and sensitive (painful). When problems have got to this stage there is no option but to remove the tooth. This leads to severe inflammation that spreads down into the space around the tooth root – the periodontal space. As the ligament holding the tooth in the socket becomes affected the tooth loosens and requires removal. This is an irreversible process. 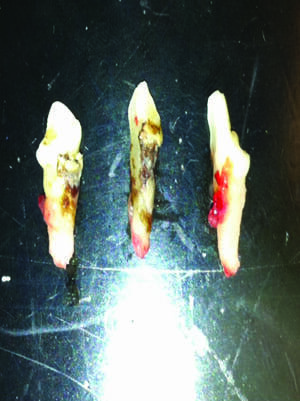 This picture shows a removed tooth which has been sectioned down to each of its 3 roots for examination purposes and shows the decay/ infection (black areas) has spread all the way down the middle root and part way down the left root. The poor dog would be in constant pain at this time. 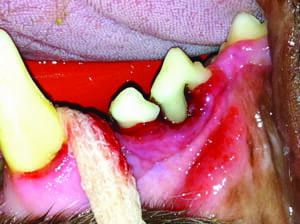 As the inflammation gets worse the gums will bleed easily when playing with a toy or chewing a tough chew. Pets are very good at masking pain and often it is only when an improvement is seen after a dental treatment that owners can appreciate the discomfort they have been in. Look for reluctance to play, reluctance to chew, pawing at the mouth and resistance to allow the mouth to be examined as signs that they have dental pain. This can be seen at the edges of gum and tarter and looks like a creamy discharge. If pus is present the infection is very extensive. 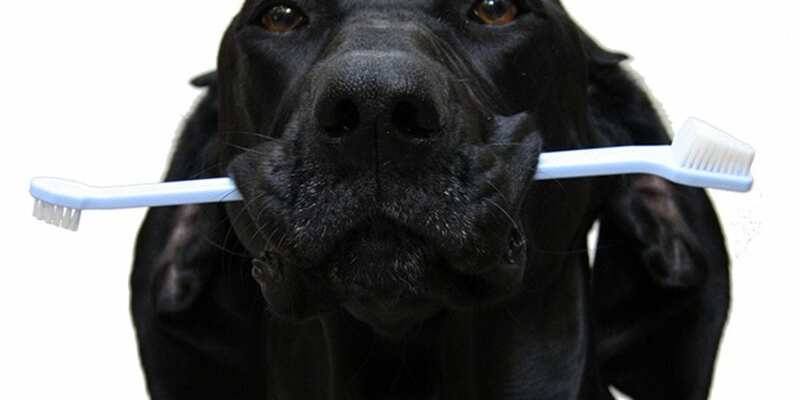 Passive: using specially formulated dental diets, chews or anti-plaque agents which help remove and soften tartar on the tooth surface but does not help the gums – so often a dental scale by a vet will be required every 6 – 18 months. No dental care: this leads to a point where the only solution is multiple teeth removal. As with most problems, prevention is better than cure and, as with humans, regular dental hygiene measures at home are not sufficient to completely prevent dental disease. It is advisable for most pets to undergo some dental treatment at a vets during their lives – this is done under a general anaesthetic. Sometimes a routine scale and polish will reveal more severe problems. Some teeth may look healthy on the outside but are rotten on the inside, which will only be picked up by x-raying the teeth. Some vets now have specialised dental digital x-ray capability. Although pet insurance companies rarely pay for routine scale and polish procedures, many will cover dental work as long as a pet has an annual health check and the work is done within a specified time period after the check. Please check your insurance policy carefully as it could prove to be expensive if you miss a routine check.